In the May-June 2008 issue of Chemistry International <www.iupac.org/publications/ci/2008/3003/ic.html>, Daniel Tofan reported on the Periodic Table Database/XML project, an effort to provide an online, open source of data about the elements in various formats. This article reports on a new online periodic table program Tofan developed that should be helpful to chemistry teachers. Printable periodic tables come in handy for distributing to students taking chemistry exams, particularly in lower-level courses. The ability to control what information to give students about the elements is important in such courses. 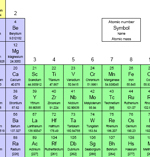 For some classroom activities, it is also useful to provide “blank” periodic tables that students can be instructed to fill in with the properties they learn. Part of a periodic table generated with Periodic Table PDF Generator. Scott Van Bramer has provided a few periodic table templates that can be used for this purpose.1 I created a brand new program, the Periodic Table PDF Generator, which allows users to generate customized versions of the periodic table as PDF files. The software is written in Java and displays a GUI that allows the user to select what information to display for each element box (for now only the basic data is available: atomic number, symbol, name, and atomic mass) and to color the background of the element boxes based on several categories of properties. Atomic masses can be customized to display the chosen number of decimals, four significant figures, or all known digits. Two page sizes (letter and legal) are available, as well as landscape and portrait orientations. The program is completely free and can be found at <www.intelot.com>, under Products.2 In order to run the program, you need Java Runtime Environment installed on your computer. The program is launched from any browser via Java Web Start. You will need to “trust” the publisher in order to launch the program (an option that appears right after downloading the program). Selecting options is self-explanatory, and upon submission of the chosen options, a PDF file will be created and returned to you from the server, containing a printable periodic table exactly as you designed it. I developed and tested the program on Windows machines, but it will run on any platform that supports Java (Mac, Linux, Solaris etc). I recommend installing the most recent version of the JRE3 for full compatibility. There is a “Contact us” page on the website that will send feedback directly to me. I encourage anyone who has suggestions for further improvements to let me know what you would like to see in a future version. Also, please report any bugs or unexpected behavior that you discover while using the software. Contact Daniel Tofan at <intelot@gmail.com> for further information. Daniel Tofan is an assistant professor in the Department of Chemistry at Eastern Kentucky University in Richmond, Kentucky, USA. Page last modified 15 September 2009.